Anastasia Hiskia received her Diploma in Chemistry (1981) from the University of Athens, Greece and a Doctorate Degree in Chemistry (1989) from the University of Athens in collaboration with NCSR ‘Demokritos’ under the supervision of Dr. E. Papaconstantinou. She worked at the General Chemical State Laboratory, 1983–95, in environmental chemistry. She joined the Catalytic–Photocatalytic Processes Laboratory, Institute of Physical Chemistry, NCSR ‘Demokritos’ in 1995. 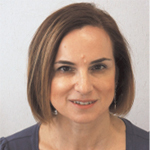 Since 2005, she has been Director of the Catalytic–Photocatalytic Processes and Environmental Analysis Laboratory, Institute of Nanoscience and Nanotechnology, NCSR ‘Demokritos’. Her current research interests include photocatalysis with metal oxides and polyoxometalates, identification of intermediates and elucidation of reaction mechanism, water purification with Advanced Oxidation Processes, evaluation of photocatalysts, photocatalytic synthesis of metal nanoparticles, environmental analysis and method development for the analysis of cyanotoxins. Photocatalytic water treatment with irradiated semiconductors has been proposed as an effective and environmentally attractive technique for water purification. Degradation of organic pollutants into CO2 has been extensively studied for most of them including various classes of phenols, chlorophenols, pesticides, azo-dyes and pharmaceuticals. Recently, it has been demonstrated that TiO2 based photocatalysis can effectively degrade cyanobacterial toxins as well as water off-odor compounds in aqueous solutions. Even if it appears that new TiO2 based photocatalysts can be promising materials for water treatment applications, a reliable testing is needed taking into account the parameters that can affect the results. The production of new photocatalytic materials that enter the increasing market of photocatalytic applications necessitates the use of a reliable and reproducible test method for the evaluation of their performance with relevance to water purification. Until now, although there are two ISO standards available for assessing the photocatalytic activity of surfaces with regards to water purification, no European standards have been developed yet. Additionally, the existing standards necessitate improvements to include bulk photocatalytic materials, visible light illumination, etc. In this frame, European Committee for Standardization, CEN, is working on these issues. Another important issue is the synthesis of modified materials with improving performance as well as photosensitized materials able to be activated by visible light. The relatively large energy gap (3.2 eV) of TiO2 facilitates the utilization of no more than a few percent of the solar energy available on earth. For this reason many attempts were carried out to red-shift the absorption edge of the photocatalyst. These attempts include surface modification via organic materials (sensitization by dye molecules), coupling with semiconductors, coupling with metals (thus taking advantage of surface plasmon resonances), doping with nonmetals such as N, C, F, S, and metal doping or bandgap modification by creating oxygen vacancies. As an example of application of new TiO2 based materials, a recent study on photocatalytic degradation and mineralization of potent cyanotoxins in water under UV-A, solar and visible light irradiation will be discussed. Furthermore, intermediate products formed during the photocatalytic process and final products will be presented and possible degradation pathways will be proposed. Differences on reaction mechanisms under UV-A and visible light will be assessed and evaluation of the new generation of doped photocatalysts will be performed.